Photography of Daniel Parker appears in new book. 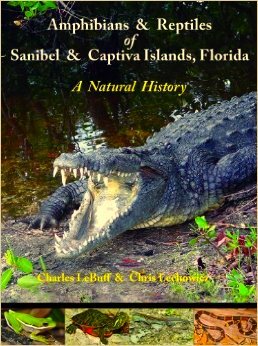 Amphibians and Reptiles of Sanibel and Captiva Islands, Florida: A Natural History was written by retired sea turtle biologist Charles LeBuff and herpetologist Chris Lechowicz of the Sanibel-Captiva Conservation Foundation. This title summarizes more than a fifty-year study of the herpetofauna of Southwest Florida and in particular the two famous barrier islands. All amphibians and reptiles that have been documented on Sanibel and Captiva islands are included and a four-species supplemental list is appended for historical purposes. The authors called on Bill Love and Daniel Parker, both well-known herpetological photographers, to photograph animals for their book. Both men contributed their finest work and the result is remarkable. Books signed by the authors are available here for $29.95. Email sunshineserpents@gmail.com to order.